Hamburg - The North of Europe Steam Navigation Company. Machinery: 250 hp Side paddle. Steam 2 cyl. Registered: 21st December 1852 at Grimsby by S. Andrews. 11th September 1849. Sailed from Hull for Hamburg. 25th September 1849. Sailed from Hull for Hamburg. 9th October 1849. Sailed from Hull for Hamburg. 22nd October 1849. Sailed from Hull for Hamburg. 8th November 1852. Bought by The North of Europe Steam Navigation Company for £15,750. and put on the Great Grimsby and Hamburg route. 28th November 1853. 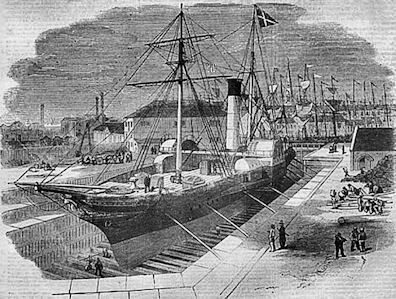 While departing from Grimsby, a mooring rope pulled Mr. Barker into a mooring post causing him serious damage. 26th December 1853. While steaming up the Thames she swamped an eight-oared cutter by the heavy swell which caused Mr. Charles Giamelli to drown. He was discovered two days later entangled in the chain of the anchor of a vessel lying off the London Docks. 29th January 1854. Arrived at Lowestoft for coals, and sailed for Hamburg. 26th October 1855. Arrived at Gibraltar from Constantinople with gunpowder and Ordinance stores, and several horses. 12th March 1856. Arrived at Lowestoft, Captain King, from Grimsby for the purpose of receiving new boilers at the company’s factory. 26th April 1856. Docked in the new Graving Dock which had just opened. 9th May 1856. Taken out of the graving dock. 13th May 1856. Sailed from Lowestoft, Captain Fairbairn, for Grimsby. Had new boilers and undergone a thorough repair at the company’s factory. 1857. Registered by W. S. Andrews. 1858. Registered by The North of Europe Steam Navigation Company. 7th June 1858. The North of Europe Steam Navigation Company’s board proposed the sale of three ships, ‘Tonning’, ‘City of Norwich’, and the ‘Hamburg’ to Sir S. M. Peto for the sum of £28,000. 1859. Registered by Sir. S. M. Peto. 1860. Returned to the Aberdeen, Leith & Clyde Shipping Company, Registered by John Webster. 12th October 1862. Stranded at Scotstoun Head while on passage from Kirkwall to Granton and later broke in two.